Canada's former foreign affairs minister is calling for more action from the federal government as the world hits what he calls "a tipping point" in the Syrian refugee crisis. Lloyd Axworthy, when pressed for a number figure, said he believed Canada could accommodate about 50,000 refugees and he would like to see the majority of those come from refugee camps on Syria's borders. His comments echo similar comments made this weekend by the retired general of Canada's Armed Forced, Rick Hillier. "I think that there could be a much stronger sponsorship. In some of the past refugee crises the Government of Canada not only brought in refugees on its own account, but it gave incentives and financial support for communities to do so. There's some of that taking place, but not nearly to the extent that say took place during the boat people, or even in the Kosovo case," Axworthy told CBC's Weekend Morning Show. On mobile? Hear the full interview here. Axworthy served as Canada's immigration minister from 1980 to 1983, and again from 1993 to 1996. He was then the minister of foreign affairs from 1996 until 2000. 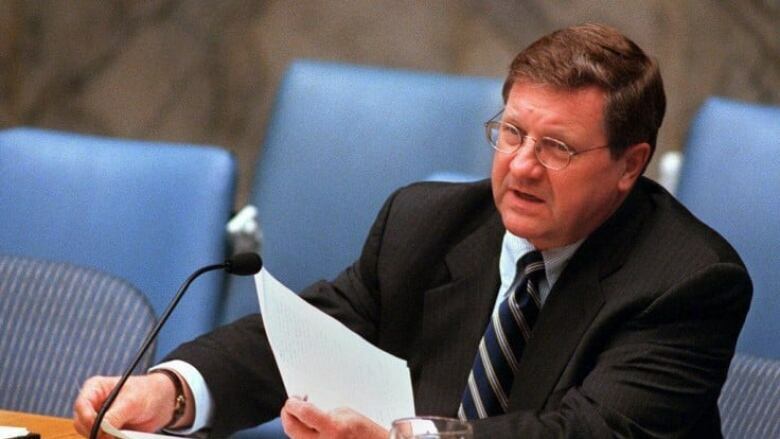 This put Axworthy in the driver's seat for the tail end of the refugee overflow that followed the Vietnam War, as well as during the 90s conflict in the Balkans. Between 1979 and 1980 alone, Canada admitted about 50,000 people from Vietnam and the surrounding areas, known as boat people. More than 55,000 boat people total settled in Canada in total during the 70s and early 80s. In the case of Kosovo, as foreign affairs minister, Axworthy worked to bring in more than 5,000 refugees to Canada using chartered aircraft. Axworthy attended meetings in Salzburg, Austria last week to learn more about what different countries in Europe are doing to cope with the influx of refugees. Canada should rise to the occasion and help coordinate efforts, the way it did in historical refugee crises, Axworthy said. "In the past I think Canada has shown some real leadership in trying to bring collaboration and cooperation together, trying to get countries to agree on a common response, and I still think that's a role we can play because we are respected in terms of the past responses that we've made," Axworthy said. He said he witnessed great political division and fear amongst Europe's leaders, which ultimately means that human beings in refugee camps are losing out to politicians' need to protect "their borders as some sort of sacred icon," he said. "What we've kind of overlooked in this, I mean I think it's always in the back of my mind, is that we're seeing these movements into Europe but we're forgetting that in the small countries on the border of Syria – Jordan, Lebanon – you've got hundreds of thousands of people concentrated," he said. "So these very small, poor countries have been bearing the burden up until now and I think the dam has just burst, we just hit a tipping point, and it's going to continue. I mean, as long as the conflict is going on, people are going to try and escape." What do voters hear in Conservatives' message on refugees?